Cooking at home away from home is real fun and also a learning experience. Here in Portland, I just raid my daughter-in-law's pantry, lay my hands on ingredients which I had never cooked before and start playing with them ! 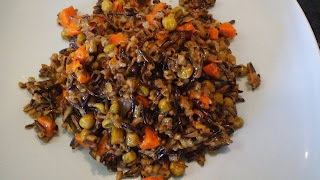 Here is my simple Vegetable Pulao where I have used " Black Rice" instead of the usual Basmati rice. In ancient China black rice was cultivated only for the Emperor's consumption. The superior quality grain was forbidden to the general public and hence it was also known as "Forbidden Rice". The black grain looks like the long Basmati rice. 1. Heat oil in a pan and add the cumin seeds and allow to splutter. 2. Add cinnamon, cloves and cardamom. 3. Stir in onion and garlic and fry till golden in colour. 4. Add the chopped ginger, green chillies and the fennel stem and saute for two minutes. 5. 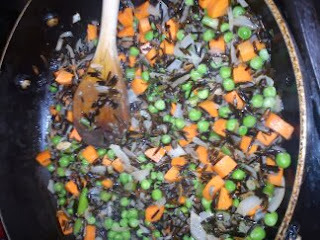 Drain the presoaked Chinese Black rice and add it to the seasoning. 6. Saute until dry and stir in the carrots and peas. 7. Add salt and four cups of water and bring it to a boil. 8. Lower the flame, cover and cook stirring occassionally. 9. Cook till all the water is absorbed and till the pulao is done. Enjoy the nutty flavour of the Forbidden Rice Pulao with any gravy of your choice. Feeling happy and relieved after the book release. Now that I am back to my food blogging I am posting the recipe of SEERAALAM - a roasted lentil curry, which was hibernating all along in my draft. Urulaikizhangu Roast and Bisibele Bath is my family's favourite combo for a Sunday lunch. Potatoes that too roasted ones were taboo for my cousins who were pursuing a particular diet. Hence when they joined us for a Sunday Bisibele, I prepared SEERAALAM instead. They mistook the curry for roasted Senaikizhangu/Elephant Yam Curry until they tasted it. 1. Wash and soak Green gram dal at least for an hour. 2. 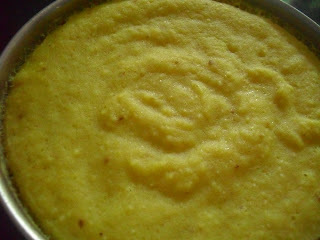 Drain the dal when it is soft and grind together with green chilly, ginger, turmeric powder and a pinch of salt. Add water as required and grind into a smooth and fluffy batter. 3. 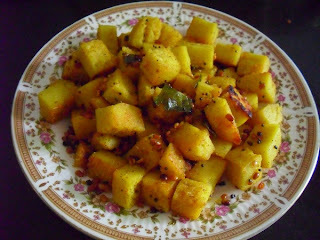 Grease the idly plates ( I used Tattae Idly plates) and pour a ladle of batter into each plate. 4. 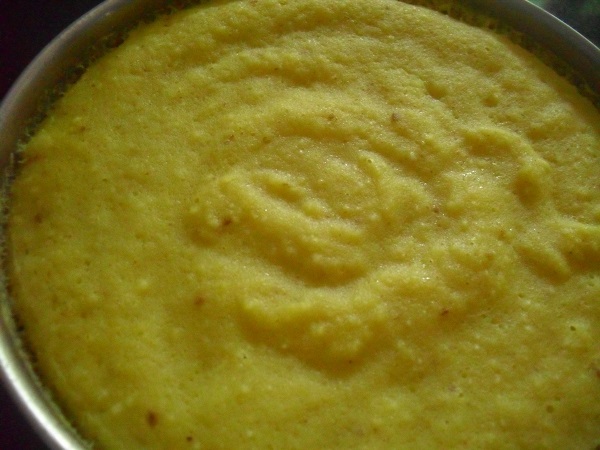 Steam the lentil "idlies" in a pressure cooker for 15 minutes without the weight. 5. Allow the 'idlies" to cool down. 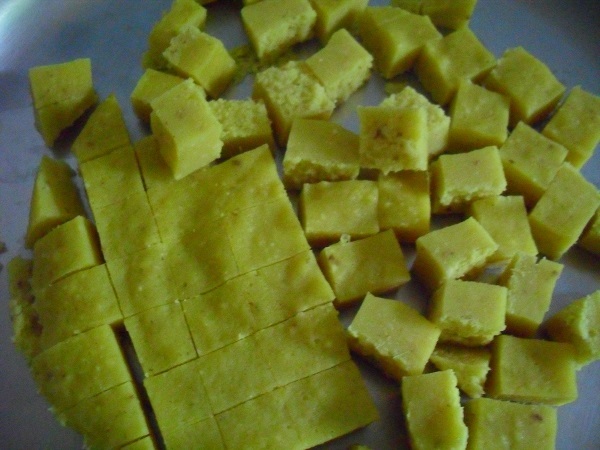 6.Chop the "idlies" into small cubes. 7. 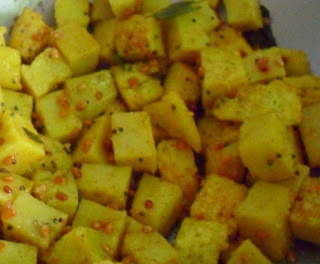 Heat oil in a heavy bottomed pan and add mustard seeds. 8. When the mustard seeds splutter add the split Black gram dal and roast till it turns golden in colour. 9. Add asafoetida and the curry leaves. 10. 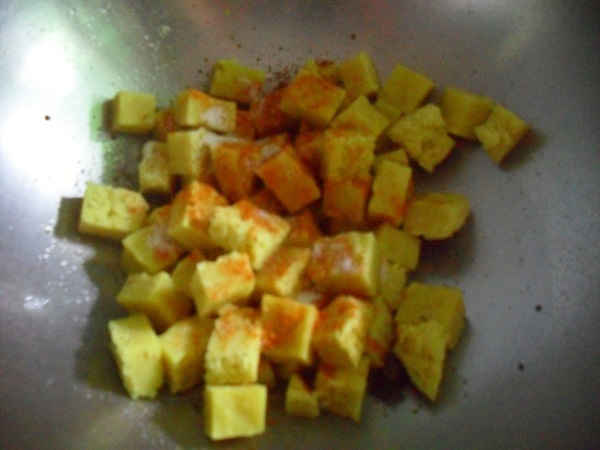 Finally add the cubed lentil ''idlies'' into the seasoning and sprinkle the sambar powder and salt. 11. Stir well using a spatula so that the Seeraalam is coated well with the spice and seasoning. 12. Cover with lid and cook on low flame for three minutes. 13. Remove the lid and roast the curry on low flame till it becomes crisp, stirring now and then.